This flavorful mixture of whole spices is used in all traditional pickling and canning recipes including dill pickles, pickled eggs, tomatoes, onions, and peppers. Delicious in soups and stews. Mix 3 Tbsp spice with 4 cups cider vinegar for a tasty, spicy vinegar. 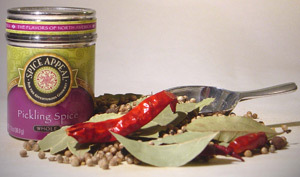 Ingredients include cracked cinnamon, bay leaf, black peppercorns, brown and yellow mustard, dill seed, cardamom, coriander, and a variety of other spices.